Tampa conference prepares march on the Republican National Convention | Fight Back! Tampa, Fl - About 50 people from across the country gathered here June 16, on the University of South Florida campus, for the Coalition to March on the Republican National Convention Organizers Conference. There were representatives from more than 30 labor unions, student organizations, anti-war groups and immigrant rights groups from Florida, Minnesota, Illinois and North Carolina, including the Graduate Assistants United at the University of Florida, Students for a Democratic Society, the Committee to Stop FBI Repression, the United National Anti War Coalition, and Students Working for Equal Rights. The conference focused on reaching out to groups and organizations opposed to the Republican agenda, in order to bring them to Tampa for the march. At the conference, participants discussed the importance of the Coalition’s central demands - Jobs, Health Care, Affordable Education, Peace, and Equality - and ways of accurately conveying their message to the media. 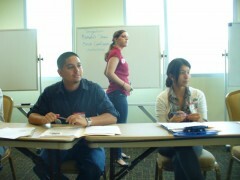 Marisol Marquez and Fernando Figueroa, two of the lead Florida organizers for the Coalition to March on the RNC, facilitated a full schedule of workshops and planning sessions aimed at building for the march on August 27, the first day of the convention. Mick Kelly, an organizer of the massive protest at the 2008 Republican Convention urged an all out national mobilization for the opening day of the RNC. Joe Iosbaker, a key organizer of May’s NATO Summit protest, summed up the key lessons of the Chicago demonstration. Tracy Molm of the Committee to Stop FBI Repression noted that the government would work to derail the planned protest. Angel Buechner, of the Twin Cites based Welfare Rights Committee stated that low-income people would join the Coalition’s march. In break-out planning sessions, conference participants announced two national days of action to build for the August march in Florida. On Monday, July 2, the Coalition to March on the RNC will hold a national call-in day to the City of Tampa demanding the right to march within sight and sound of the Convention on August 27. Then, on Friday, July 27, coalition partners will hold demonstrations, pickets and protests outside of local Republican Party headquarters or corporate sponsors of the Convention. The organizers’ conference closed with a short press conference on the University of South Florida campus. Energy is high as activists prepare to take these plans back to their communities and prepare for the historic march on the RNC on August 27.